So, she wanted to be a clown. But you didn't know she was going to be a scary clown. Oh boy! This girl's Killer Clown Costume will transform any completely normal, well adjusted young lady into something much more twisted. A dark deviant who makes her home at the circus. You might hope to never run into a killer clown, but if you're caught under the big top at night, you might find yourself coming face to face with a machete wielding clown in black and white. Yeah, that would be the killer clown! Scary stuff to be sure, but it's all fun at games, at least it will be when she has this costume. This costume does not include a weapon, so she can spin the traditionally evil character in a new direction. Whatever kind of clown she'd like to be, we're sure this easy costume will be the perfect choice for Halloween. Whatever kind of character she'd like to be, she'll find the right look with this classic costume. Tulle and mesh accents on the dress make this costume look pretty cool, and the matching tights continue the costume print theme. The headband hat fits over a wig of her choosing (wig not included) or you can let her style her own hair with temporary hair coloring. 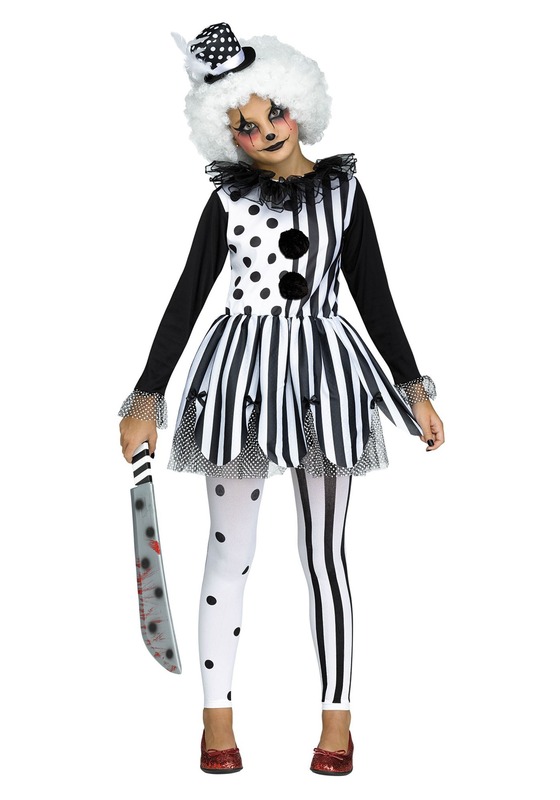 Whether she wants to be scary for Halloween or is ready for a lighter take on a clown theme, this classic costume will prove to be a great choice for her!